As more people make their health and well-being a priority, the niche industry of wellness travel is rapidly growing. Adorned in crystals and situated on top of a granite bluff overlooking Lake Okanagan sits Sparkling Hill Resort, a modern oasis of well-being and one of the premier wellness destination spa resorts in the world. 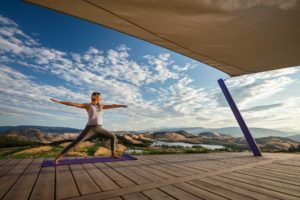 The primary purpose of wellness travel is maintaining, promoting, improving or kick-starting a healthy lifestyle and increasing your sense of overall mental well-being. When you travel with the intent of ‘wellness’ you are taking action to better your mental, physical and psychological state. The general goal of wellness travel is about improving the overall quality of one’s life. Popularity for this new type ‘getaway’ is partially in a reaction to aging, an increase in lifestyle diseases such as arthritis, obesity and depression, and the failure of conventional medicine to address certain chronic conditions. Wellness travel gives you a chance to remove yourself from your normal environment and experience a physical and mental break from the stresses of daily life, while indulging in healthy activities and food. As a result, you return home with a renewed sense of well-being. While some vacations leave you returning home with the need for another vacation, wellness travel is intended to give you the rest and experiences you live a healthier lifestyle. Couple these benefits with an opportunity to escape the chaos of the everyday world at an upscale hotel like Sparkling Hill Resort, and it’s a match made in wellness heaven. The Resort offers services ranging from traditional massages to signature treatments, such as the Cryo Cold Chamber treatment. Sweeping scenes from our Mountain View and Lake View rooms allow guests to fully take in the awe-inspiring landscape of the Okanagan while PeakFine Restaurant serves inspired farm-to-table options, making Sparkling Hill Resort a true escape from the stresses of the modern world, with everything needed for whole body wellness.